The IDS Logic Rulekit was created based on requests and feedback from the community to help automate common tasks. All of the Rules list below are included in IDS Logic LAS, IDS Logic Suite, and IDS Project Membership packages. Checks for transactions in the In Transit to Pick Up Location queue and determines how long transactions have been in that status. Applies a configurable delay (in minutes) before routing transactions to the Awaiting Customer Contact queue, where patrons will be contacted by ILLiad. Allows for a configurable delay in patron notification for Borrowing Loans, reducing the number of steps to notify patrons, and allowing staff enough time to process loans. On a daily basis, looks at Customer Notified via E-Mail, or other custom queue (i.e Library Use Only) where items awaiting pick up are kept. Adds flag indicating which items need to be sent back to the lending library. 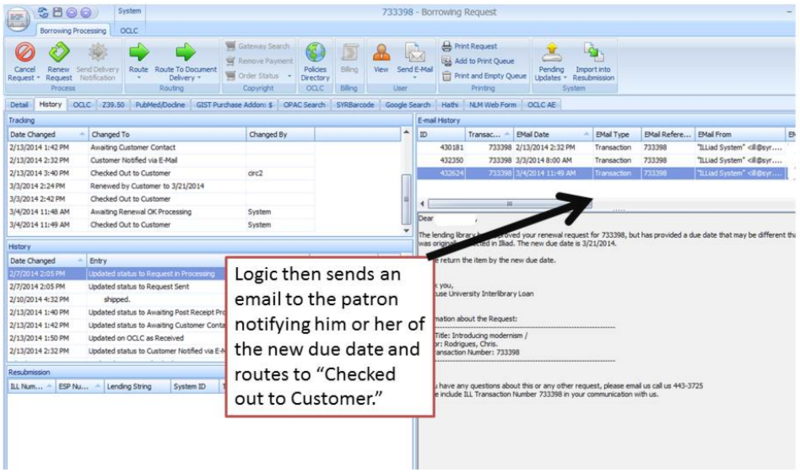 Optional email can be sent to patron notifying him or her that the item has been returned. Makes maintenance of shelves where ILL items awaiting pick up much easier to maintain. Add email template to Customization Manager, and provide name of template to IDS staff. Determine the subject of the email to send to patrons. Create custom flag that you would like to use to mark items that need to be returned. Sends reminder email to patron reminding him or her to pick up their ILL item. The number of days after the item is put in Customer Notified via E-Mail or other queue is configurable, and default is 7 days. Reminds patrons to pick up ILL materials. Add an email template to Customization Manager, and provide name of template to IDS staff. Identifies a system note that is created when the lending library provides a different due date than your system settings. Reformats the date in the system note, and updates the due date field in the ILLiad transaction based on the due date provided by the lender. Routes transaction to Checked out to Customer status. Transactions in this queue are typically providing longer due dates than what your system settings are, and this is a good way to “pass on” the extra renewal time to the patron without opening the transaction and processing it. If the due date is less than the due date that was requested by the patron, this is a good way to notify them that they need to bring the book back earlier. An email template in your Customization Manager for the automated email that is sent to the patron. 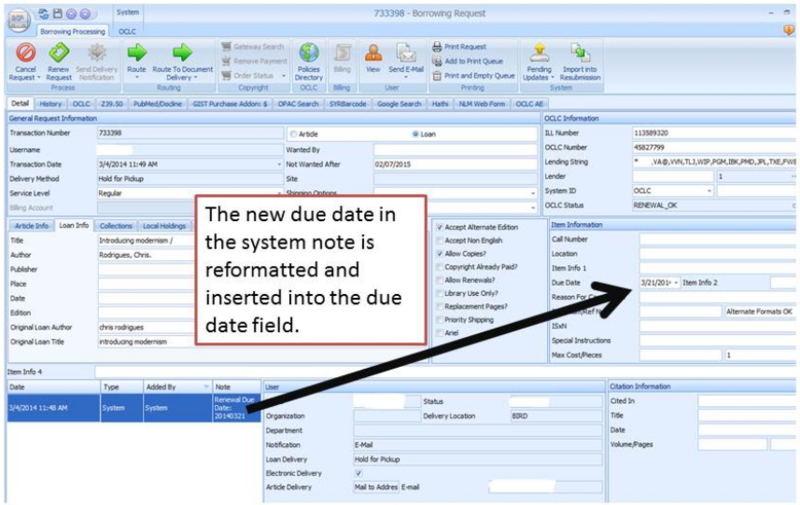 Figure 1: Transaction detail of Renewal OK Rule showing reformatting of system note to due date. Identifies a system note that is created when the lending library provides new due date after renewal request is denied. Notification to patrons that their renewal has been denied is sent within minutes after the lending library has denied renewal, giving the patron as much notice as possible. Processing renewal denials manually is no longer necessary, and the patron receives needed notification. Checks the Creation Date field to see if the request was created more than 7 days ago. Adds a Stale Request flag. Routes to a custom queue (optional). Sends email to patron updating them on their request (optional). Provides borrowing staff a way to determine what transactions in Awaiting Unfilled Processing are problematic, and should be prioritized, purchased, or cancelled. Patron can be automatically notified that their request wasn't found initially, but is still active and will be delayed. Presents a daily proactive approach to updating patrons on problematic transactions that may take longer to retrieve. If email notification is desired, the email template must be in the Customization Manager, and provided to IDS for configuration. A subject for the email being sent should be provided. Checks Creation Date field to find items that are in jeopardy of expiring in OCLC. Default is over 3 days old, but the amount of time from Creation Date is configurable (for example, if you wanted to flag transactions that were 2 day old, that would be possible). Adds text to specified fields in ILLiad, in case you wanted something like "Priority" to print on pull slips. Provides lending staff an efficient way to find problematic lending transactions or find issues where a pull slip is lost or another issue caused a delay. Allows staff to find and resolve requests before they expire, and if a request needs to be cancelled, cancellation is performed more quickly. Checks Due Date field to find items that are long overdue. Default is over 28 days overdue, but time overdue to check is configurable. Send email to borrowing library that you are checking shelves and indicate next step (i.e. invoicing). Provides lending staff an efficient way to find overdue loans and the ability to group loans with call # and location to check shelves to prevent OCLC Special Messages, or allowing too much time to elapse to find misrouted book/item in mail. Allows for proactive daily or weekly monitoring of the Item Shipped queue, and offers an option to check shelves before invoicing other library.